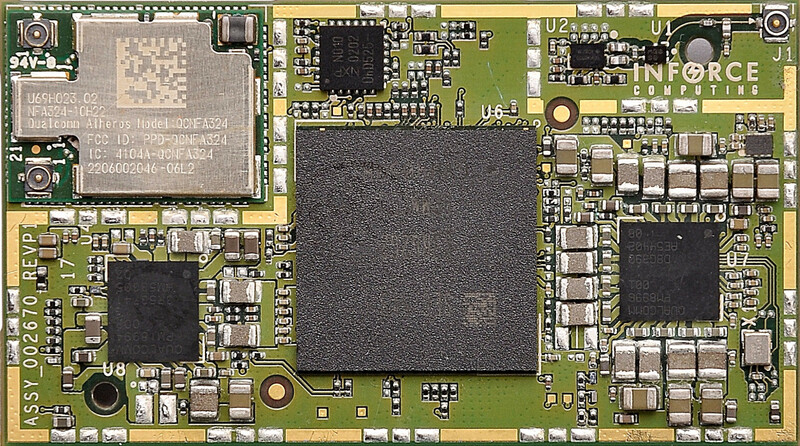 Inforce 6601 micro SoM Snapdragon 820 System-on-Module Embeds WiFi, Bluetooth and GPS - Inforce Computing, Inc. Storage – 64GB UFS 2.0 gear 3 flash up to 5.83Gbps, 1x micro SD card 3.0 interface for support for to HS400, optional eMMC 5.1 flash. Certifications – RoHS and WEEE compliant, FCC. The company provides Android 6.0 Marshmallow / Linaro Ubuntu Linux BSPs for the module, as well as several free Qualcomm SDK such as Vuforia VR, Alljoyn proximity connectivity, FastCV computer vision, Symphony System Manager, and Snapdragon for facial recognition. SYS6601 development kit includes a Inforce 6601 Micro SOM pre-loaded with either Linux and Android, a mini-ITX baseboard, and other accessories. It’s exactly the same carrier board as for SYS6501 development kit so I won’t repeat the specs again. Inforce 6601 micro SoM is sold for $270, while the complete development kit goes for $475. More details can be found on the product page.